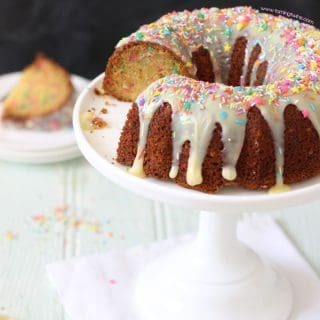 This Funfetti Bundt Cake topped with White Chocolate Ganache (and even more sprinkles) is crunchy on the outside and has a delicious texture when cut. It’s oh so pretty to look at but simply to make. Sometimes, a recipe just, kind of happens. Often the recipes you read from me here are things I’ve been making, around and about, somehow for years and years. It’s only when I decide to actually post them that I try and pin down how I make them. I wonder how I measure ‘add a big glug until it looks about right’ or ‘chop until it’s almost squishy but not quite’. These are the thoughts that go through the mind of a fly-by-the-seat-of-my-pants intuitive cook. But baking, baking’s a bit different. Baking doesn’t tend to ‘just happen’. Baking is a science and a balance and not something for messing around with. Most of my cake recipes are some kind of variation on a basic sponge mixture (equal weights) but for a while, I’ve been trying to come up with a different kind of cake. Something a bit more sturdy, that will last well and stand on it’s own without too much decoration. As it wasn’t going to have too much icing, it would need to be a sweeter sponge and a decorative tin would be called for to add that certain oomph. And so, the story of this cake. This cake my friends, did not ‘just happen’. I’ve made this cake 7 times in the last few weeks. My husband says that if he sees another bundt cake he might throw it out of the window. It’s been too greasy or too browned or the ganache was too runny and a few other problems in between. Honestly? I’m still not quite there but I thought I’d share this with you as a bit of a work in progress. This recipe is good and I’d happily make one each week, but it’s not quite perfect. 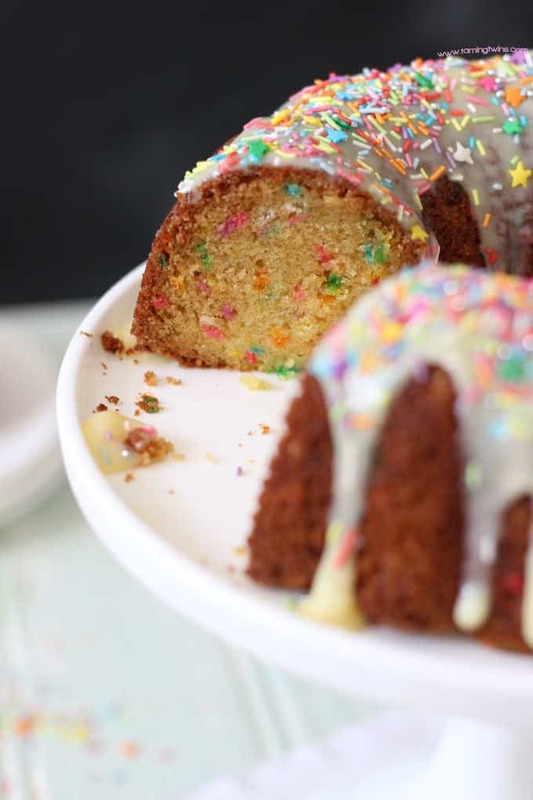 It’s golden, crumbly, with the crunchy fun of the sprinkles inside and on top. The ganache makes you want to dip in chunks of fallen cake and mop it up with your fingers. But something, is just not quite perfect, just not quite what I was actually trying to make. Anyway, I’m embracing the Japanese concept of wabi-sabi (the beauty and acceptance of imperfection, isn’t that a wonderful idea to adopt in life in general?) and so, here is my Funfetti Bundt Cake with White Chocolate Ganache. I hope you enjoy it as much as I have enjoyed testing them. 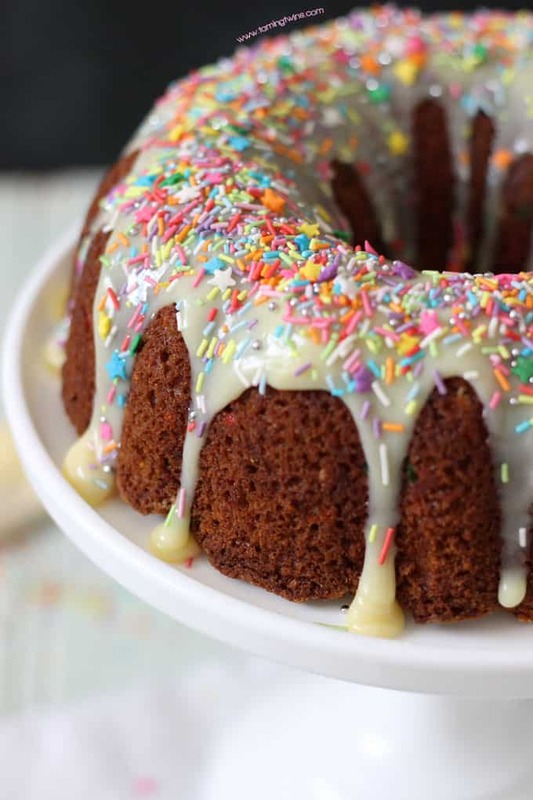 Invest in a good quality bundt tin, they are a brilliant buy, that makes even the simplest cake look impressive. 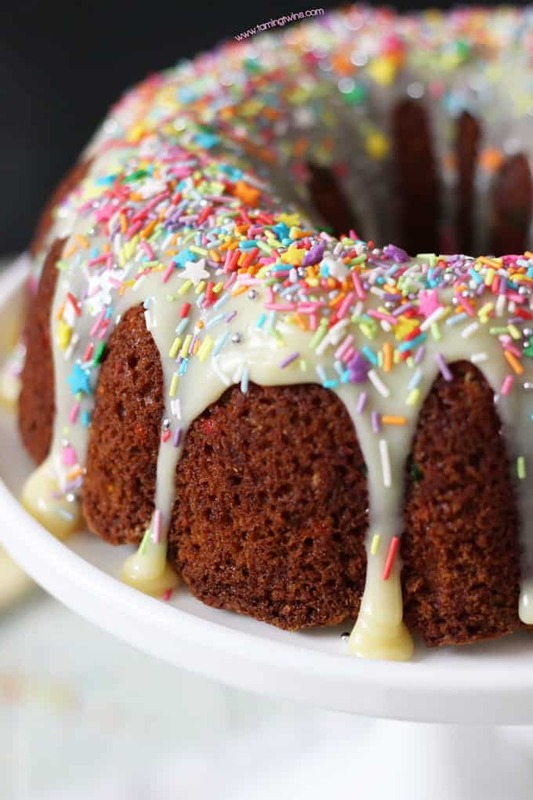 This cake was made using this one: Masterclass Non Stick Bundt Cake Tin. Whatever sprinkles you choose, go for fairly sturdy and very bright ones. I used something like these: Pastel Rainbow Confetti Sequins. Make sure that you use excellent quality vanilla extract, never essence. Nielsen-Massey Vanilla Extract is my absolutely favourite. This really makes the cake something special. The cake stand pictured is my Milk Glass Cake Stand that I’m as in love with as the day I bought it. Beat the butter and sugar until pale, light and fluffy. Beat in each egg, one at a time, until fully combined. Stir in the flour and bicarbonate of soda until fully combined, then add the yoghurt, vanilla and sprinkles and mix until totally combined. 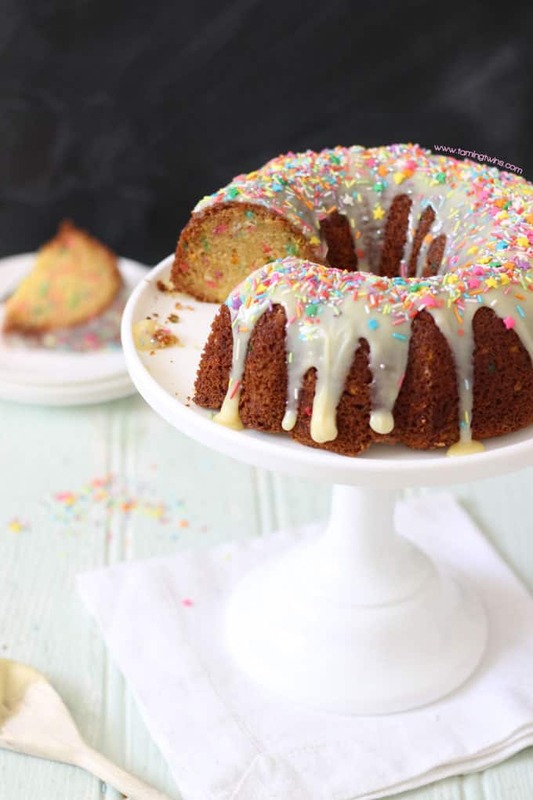 Grease your bundt tin very thoroughly and then cover the inside with a dusting of flour, tapping out the excess. 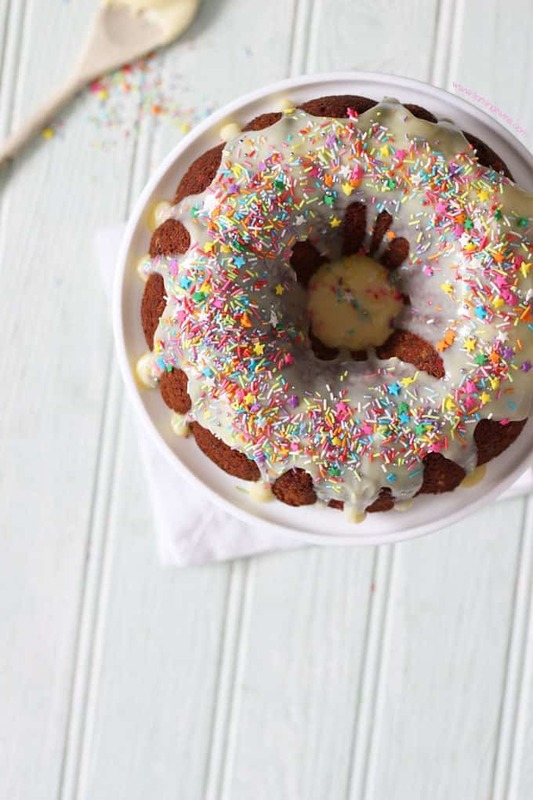 Fill the bundt tin with your batter, evenly spreading it. Bake for 50 - 60 minutes. Meanwhile, make the ganache. Chop the chocolate very finely and heat the cream in a small saucepan until almost bubbling. remove from the heat and add the white chocolate. Stir until the chocolate is melted and you have a thick ganache. Put to one side (at room temperature). Allow to cool in the tin for 15 minutes and then tap firmly on the worksurface and turn out. When the cake is totally cold, top with the ganache and extra sprinkles. What’s your wabi-sabi moment in life, a perfectly imperfect work in progress? 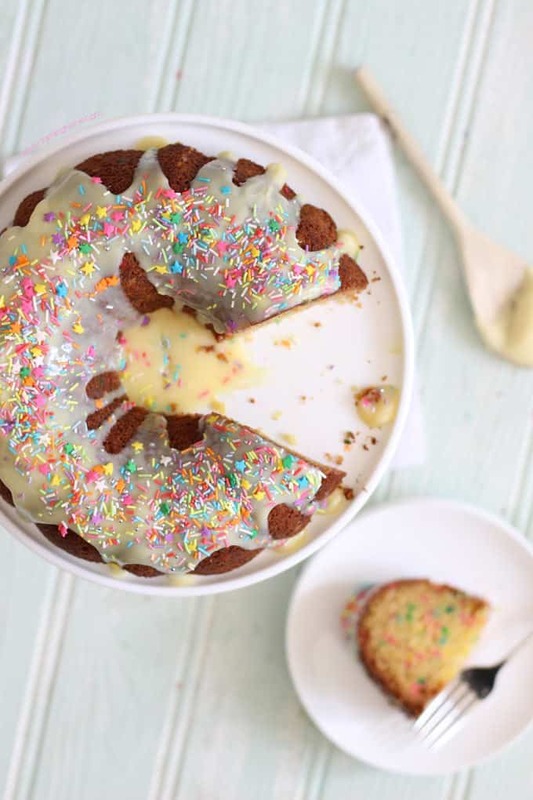 Pin the Funfetti Bundt Cake with White Chocolate Ganache recipe for later..
Love the term wabi-sabi, I’ve not heard it before but I’m going to keep it in mind in future as I have much imperfection!! I’ve just been through that same cake baking process with a new chocolate cake recipe – about 10 cakes later and I’ve finally cracked it, but I don’t think I’ll be baking chocolate cake again for a while.